In particular, the opening night gala / benefit dinner on Friday, October 30th is definitely something to look out for, as it'll be a series of food installations and happenings. 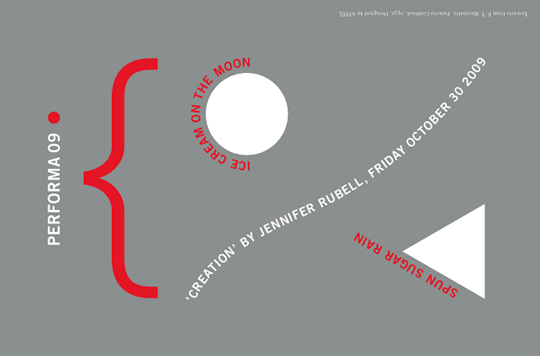 Programmed by Jennifer Rubell, the artist/hotelier/editor, "Creation" will be an "interactive food journey" through all the floors of the venue X Initiative (the former Dia Art Foundation). Starting on the fourth floor with a "participatory installation of drinking components," the two lower floors will host "edible food projects and experiences" featuring a ton of ribs, 250 pots of vegetables, banquet-style feasting tables for 100, a liquor elevator, concealed cutlery, apple picking, and edible-sculpture destruction. And it doesn't stop there: During Performa, there will also be food art programs, including a "pasta sauna" by Marije Vogelzang and a three-hour interactive food performance by Marti Guixé. Marije Vogelzang / Proef, "Pasta Sauna"
A straightforward sauna — but instead of hot coals, the steam will rise from vats of boiling pasta. A perfect opportunity to pretend you're spaghetti. 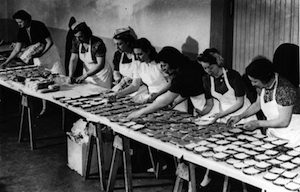 A three-hour performance and meal-in-motion that will entertain (and feed) 200 people. An interactive performance, participants will be given ceramic glasses adorned with “edible microsnacks," plus instructions for eating them while "performing small gestures that will require each person to interact with their fellow diners." 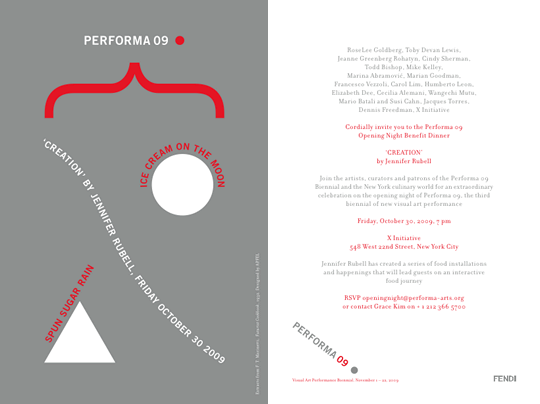 Performa Opening Night Benefit Dinner invite. View larger. $300 for a single ticket is a little much, no?